Location: Cison di Valmarino, Italy. Ownership / Access: Quaternary Investments SpA, Now houses a 4-star hotel, museum and a theatre. Notes: Castel Brando, former Castrum Costae, is a medieval castle situated on a dolomite limestone rock at an elevation of 370 m (1,210 ft) above sea level, overlooking the villages of Cison di Valmarino and Valmareno, Northern Italy. The name Castel Brando is due to the name Brandolini, the ancient family from Forlì, who were the Lords of the castle. During World War I, the castle was invaded by Imperial Austrian forces and used as a military hospital. The Brandolini family abandoned their home and escaped to their Solighetto villa near Pieve di Soligo. After 10 years of restoration work, financed by Count Girolamo IV Brandolini (1870–1935), the castle was re-opened as a place of residence in 1929. In 1959 the castle was sold by the Brandolini family to the Salesian fathers, who altered its structure to use it as a monastery and as a centre for spiritual studies. In 1997 Castel Brando was purchased by Quaternary Investments SpA, who started an expansive renovation program in order to convert it into a hotel and museum. 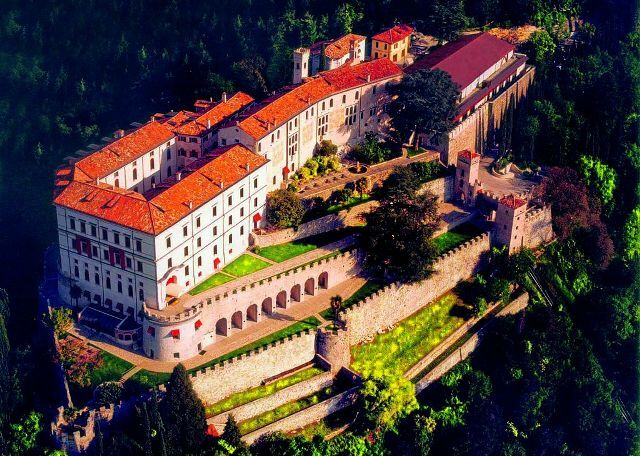 Castel Brando has now been extensively restored and now houses a 4-star hotel, museum and a theatre. Visitors can get up to the castle by funicular railway from the village. On 18–20 April 2009 Castel Brando hosted the first ever G8 Agriculture Ministers' Meeting organised by the Italian Minister of Agriculture, Luca Zaia.